With plethora number of new Android smartphones being released these days, it is sometimes very hard to find the phone you really like. 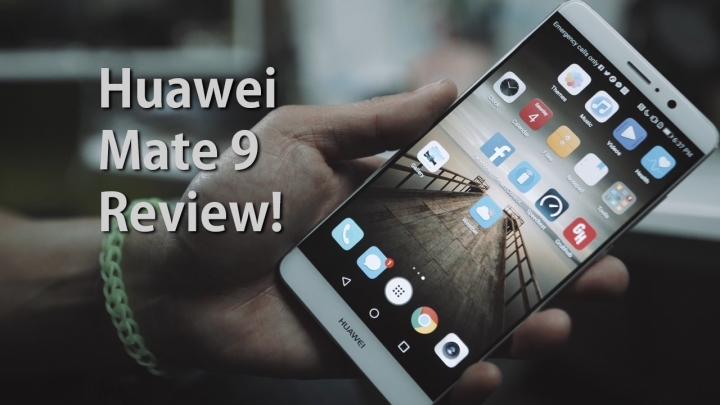 Now, if you are looking for the biggest phablet phone, Huawei’s new Mate 9 may just be your newfound love. In this review, I will try to cover all the good, bad, and also tell you where the Mate 9 shines the most. First, let’s go into all the things I like about the Mate 9. Apart from everything, the Mate 9 brings you a whoppingly large 5.9-inch 1080P screen, which is probably the biggest of them all without resorting to super mega large phones like 6.4-inch Mi Mix. I think in terms of size, the Mate 9 is a great big phone for people with extra large hands or prefer the combination of phone and tablet in one. Combine that with a stereo speaker that is fairly loud, it is definitely a media power house. The Mate 9 also has dual-SIM ability along with microSD card slot, which means great for globetrotters and data hoggers. However, you will be limited to single-SIM if you are using a microSD card slot as it also doubles as 2nd SIM slot. Performance is outstanding on the Mate 9, which comes with its own Kirin 960 CPU, plenty fast as latest phones like Pixel and S7 Edge. Now, I’ve had some issues with video playback with YouTube or controlling my Chromecast while watching Netflix where the phone would lag like crazy. Not sure if this is a hardware or software issue but it seems to happen often whenever there is online video streaming involved. Also, I happen to Periscope often, which is a video streaming service and for some odd reason, Mate 9 seems to freeze often especially when I periscope while moving in a car. This seems to be an issue with 4G LTE/WiFi connectivity. Again, this may be something fixed with a software update but overall I feel like this phone has not been thoroughly-tested with U.S. market and U.S. apps. Most of apps I use are U.S.-based and obviously having these lags/bugs do annoy me a bit and I wish Huawei would do more U.S. testing before releasing this phone to the U.S. market. Apart from those minor issues, Mate 9 is a fun phone to daily drive, especially its dual Leica lens back camera. As with its predecessors like Huawei P9, the Mate 9 allows you to take excellent bokeh blurred photos in its Aperture mode. If there’s one reason to buy this phone for its camera, the Aperture mode is definitely it. While Mate 9 suffers in low-light performance in comparison to flagships like Pixel or S7 Edge, its Aperture mode during mid-to-good lighting makes up for it as you get nice DSLR-like photos, especially for portraits. Video recording is decent with excellent stability with OIS but quality again seems to suffer. Mate 9’s has a whopping 4000mAh battery and boy, battery life is indeed excellent, one of the best I have tried. While its 5.9-inch screen may scream short battery life, its mammoth-sized battery certainly makes up for it and I’ve had zero issues in terms of battery. And yes, its Ultra Power Saving mode can really get you many hours of extra juice on just 5% of battery life. And yes, Mate 9 comes with IR blaster, meaning you can control your TV and other home appliances easily. I also dig the fact that this is also fully compatible with Peel Smart Remote app on the Play Store. This is also the world’s first smartphone with Amazon Echo’s Alexa built-in. Now, I was not able to test it out yet as Huawei will push out an update to activate it but when they do, I will certainly have a video on that. Overall, who is this Mate 9 for? I would say it is for those of you who really want to get the biggest 5.9-inch smartphone with excellent performance, battery life, and can live with its 1080P resolution. While I am not the biggest fan of 1080P on 5.7-inch screen or anything bigger, after using the Mate 9 as a daily driver for almost a month, it is definitely usable. At the cost of $599 for the U.S. retail unit, the Mate 9 certainly has its own niche cut out. This is definitely not the “best phablet” I have tried but definitely is the best daytime camera I have used with its awesome Aperture mode. Pricing is very competitive and if you absolutely need the biggest smartphone under $600 with killer daytime camera, Mate 9 may just be for your daily driving pleasures. Previous story Pixel vs. Mate 9 vs. Zenfone 3 Deluxe Camera Shootout!